This airport friendly multi tool wallet is crafted from durable stainless steel, holds cash securely and features a variety of tools, including a bottle opener, a scraper, wrenches, flathead screwdriver, Phillips screwdriver/tape cutter and metric/standard rulers. Its slim and minimalist design makes this the ideal low profile wallet. Secure cash wrap strap doesn't lose its stretch, won't weather or wear. Secure and comfortable, lightweight, low profile design. Travel and airport friendly. Dimensions: 3.6" x 2.3" x 0.14". Weight: 1.16 oz. Features a small blade, scissors, nail file with screwdriper tip, toothpick, tweezers and key ring. 2-1/4'' closed. Features a small blade, scissors, nail file with screwdriper tip, toothpick, tweezers and key ring. 2-1/4'' closed. Features a small blade, scissors, nail file with screwdriper tip, toothpick, tweezers and key ring. 2-1/4'' closed. This Cross-Cut multi-tool is equipped for cutting, gripping, personal care and the unexpected. Lightweight and compact for easy carrying. 420 stainless steel multi-tool with a satin finish. Packed with 10 essential tools and comes with a leather sheath for added portability. Compound Leverage doubles cutting power. Tools include: spring-loaded scissors, a knife blade, small and medium flat screwdrivers, a set of tweezers, a nail/cleaner, bottle opener, pick, ruler and a lanyard loop. This triple duty Financial tool is a wallet, multi-tool and RFID-blocking wallet all in one. It secures cash and cards between two stainless steel plates designed to prevent their data from being accessed. 10 different tools are integrated into this compact wallet: A Cash Wrap strap, bottle opener, 5 standard size wrenches, 6 metric size wrenches, nail removing notch, Phillips screwdriver, flathead screwdriver, scraper, metric and standard rulers and protractor. With your cash and cards securely inside, you can pop a top, open a box, tighten a screw and much more. 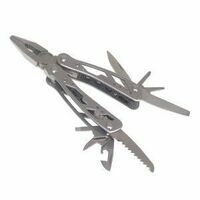 Durable multi-tool constructed of 420 heat treated stainless steel. High tensile Cash Wrap strap will expand to hold cash and cards securely inside and it won't stretch, weather or wear. Travel and airport friendly. Dimensions: 2.3" x 3.6" x .2". Weight: 1.7 oz. The multi function comes from locking implements including screw drivers, a blade and file. Can open beers and be clipped to just about anything with the built in carabineer clip. Keychain compatible, stylish, lightweight and strong. Blue stainless steel. This handy pocket tool is small in size, not in function. With a convenient butterfly open design and 8 useful components, this keychain ready mini tool is never too far out of reach. It's a bottle opener with about 9 other tools like the new splice scissors which gives you more than cutting capabilities thanks to a variety of handy tools. Stainless steel black. It's a bottle opener with about nine other tools. The pocket-sized pliers pack multiple functions into a tiny package that fits on a keychain. The vise gives you more than plier capabilities thanks to a variety of handy tools. Stainless steel black. Weighs 2 oz. Built-in LED light, click for constant on. 400 series stainless steel. Sure grip handle. Spring loaded pliers head. Includes LED light in handle, pliers, knife blade, saw blade, wire cutter, Phillips screwdriver, bottle opener, wire stripper, awl, file with nail pick, can opener with small flathead screwdriver tip and key ring. Includes 2 CR927 batteries. Stanley Multi Tool, 12 Tools, Includes: Long Nose Pliers, Wire Cutter, Saw, Standard Screwdriver (1/4 in), Small Knife, . Bottle Opener, Curve Jaw Pliers, Standard Screwdriver (5/16 in), File, Large Knife, Phillips Screwdriver and Standard Screwdriver (1/8 in), 4-1/4 in Closed Length, Stainless Steel Multi-tool includes Pliers, wire cutter, fine edge blade, scissors, medium flathead driver, crosshead driver, bottle opener, tweezers, file and a retail package opener. Dime includes a unique blade designed to safely cut and score plastic packaging and a bottle opener that is exposed even the tool is closed. Compact and lightweight. The Dime is a mini multi-tool with 12 useful tools and suspends neatly from a keychain. Smooth butterfly opening and comfortable ergonomic handles to manage obstacles. Store it in a pocket, a backpack or keep it on a key ring. Tools include: Spring loaded needle nose pliers, standard pliers, tweezers, wire cutter, bottle opener, fine edge blade, retail package opener, scissors, medium flat head driver, coarse and fine file, cross driver and Lanyard ring. Features a large blade, small blade, can opener with small screwdriver, bottle opener with large screwdriver and wire stripper, reamer with sewing eye , phillips screwdriver, toothpick, tweezers and key ring. High quality stainless steel knife. Tools include: pliers and needle nose, vise, wire cutter/stripper, cap lifter, can opener, Phillips and flat screwdriver, scribe, awl, leather bore, knife blade, metal/wood file, ruler, saw, scraper, hook remover and lanyard and nylon sheath. Features a large blade, small blade, can opener with small screwdriver, bottle opener with large screwdriver and wire stripper, wood saw, reamer with sewing eye, corkscrew, toothpick, tweezers and key ring. Features a large blade, small blade, can opener with small screwdriver, bottle opener with large screwdriver and wire stripper, scissors, reamer with sewing eye, corkscrew, hook, toothpick, tweezers and key ring. With 2 built-in LED lights to illuminate work surfaces, the multi-tool is ideal for working on the car, under the sink or other tight spaces where light is needed. Sure grip rubber handle inlays provide a firm and comfortable grip. Stainless steel construction ensures that this tool will provide years of worry free use. Spring loaded pliers head for easy one handed operation. Includes scissors, bottle cap lifter, small and medium slotted screwdriver tips and Phillips screwdriver tip. LEDs take two CR1616 batteries (included). The Suspension is an open frame multi-tool. Saf.T.Plus locking system. Components include spring loaded needle nose pliers, wire cutter, fine edge knife, serrated edge knife, saw, scissors, cross point screwdriver, small and medium flat blade screwdrivers, can opener, bottle opener and lanyard hole. All housed in a ballistic nylon sheath and it's lightweight. Titanium gray stainless steel handle. Features a large blade, small blade, can opener with small screwdriver, bottle opener with large screwdriver and wire stripper, scissors, wood saw, reamer with sewing eye, corkscrew, hook, toothpick, tweezers and key ring. Features a one-handed serrated locking blade, bottle opener with large screwdriver and wire stripper, can opener with small screwdriver, phillips screwdriver, key ring, toothpick, tweezers, reamer and wood saw. Features a large blade, small blade, can opener with small screwdriver, bottle opener with large screwdriver and wire stripper, scissors, magnifying glass, reamer with sewing eye, phillips screwdriver, corkscrew, hook, toothpick, tweezers and key ring. The Crucial offers an entire toolbox of full-sized components in one rugged stainless steel package. The handles are ergonomically curved for a better grip and more torque. The liner-locking knife blade is half fine edge and half serrated. Also contains a Phillips screwdriver, V-cut wire cutters, strap cutter and a flat head screwdriver. Built with a clip and weighing just 5 ounces, the Crucial can also be carried as an everyday pocket tool. Made of stainless steel. Compound leverage geared pliers, straight edged and fully serrated blades. Blades are accessible without opening the tool. Tools include: 1/4" Hex bit driver, 3 sided file, AWL, bolt grip channel, bottle opener, can opener, full serrated blade, Hex bit kit, jewelry driver, Large flat screwdriver, medium flat screwdriver, needle nose pliers, Phillips screwdriver, ruler, small flat screwdriver, straight edge blade, wire crimper, wire cutter and wood saw. Built to handle almost anything. Like a switchblade, the SwitchPlier 2.0 is ready to go with a simple push of a button. Silver, black finish. The SwitchPlier 2.0 provides instant one-handed access to the spring-loaded pliers making it quick and easy to use for a host of jobs, especially when your other hand is occupied. Tools include: 1/2 serrated blade, 3 sided file, bolt grip channel, bottle opener, can opener, hard wire cutter, needle nose pliers, medium flat screwdriver, small screwdriver, Phillips screwdriver and ruler. Multi-tool features Saf.T.Plus locking system, one handed opening pliers, partially serrated blade, small, medium and large flat drivers, Fiskars scissors, black ballistic nylon sheath, needle nose pliers, Phillips driver, bottle and can opener, wire cutters and wire stripper. Stainless steel handle. Features a large blade, small blade, can opener with small screwdriver, bottle opener with large screwdriver and wire stripper, scissors, pliers with wire cutter, reamer with sewing eye, phillips screwdriver, hook, toothpick, tweezers and key ring. Features a large blade, small blade, scissors, nail file with screwdriver tip, orange peeler with screwdriver tip, toothpick, tweezers and key ring. One-hand open design and durable stainless body. Tools include: needlenose pliers, regular pliers, pinch cut wire cutters, one-hand opening, Lanyard ring, Serrated knife, Saf.T.Plus locking knife and tools, can opener, cross point screwdriver, ruler, wire crimper, file, small, medium and large flat blade screwdriver, bottle opener and fine edge knife. Weighs 9 oz. Blunt nose stainless Multi-Pliers with one-hand opening features replaceable tungsten carbide wire cutters. When the cutters become dull or misshapen simply rotate the tungsten carbide cutters 120 degrees and you've got yourself a good as new wire cuter. After three rotations, the entire cutter can be replaced. Tools include: blunt nose pliers, regular pliers, Tungsten carbide insert cutters, one-handed opening, Saf.T.Plus locking knife and tools, Lanyard ring, file, fine edge knife, cross point screwdriver, wire crimper, bottle opener, ruler, can opener, serrated knife and small, medium and large flat blade screwdriver. Weighs 9 oz.